For some reason, anyone can play the piano, or violin, or clarinet, and the world smiles benignly and wishes them well in their endeavours. However, as soon as the chosen instrument becomes drums, everyone has a problem, from family, to neighbours, to law enforcement agencies (try telling a policemen you play drums and see how their attitude changes), to just about all of the rest of the world. Even playing a supposedly much quieter electronic kit can have its issues. Although the actual volume might be considerably less, the vibrations put out by an electronic kit can be pretty annoying to anyone who is mechanically linked to the room you are playing (basically anyone in the same house, terrace or apartment block). So what can we do about it? Well actually quite a bit. The first thing to realise that what disturbs people about you playing your electronic kit is actually vibration, not ‘noise’ as such – it is structurally transmitted, not air transmitted. So, another way to look at it is that it isn’t the sound coming from the speaker cone of you stereo system, but the vibration of the speakers through the floor. And vibration can be pretty easy to deal with. If you are lucky enough to be able to have your electronic kit set up all the time, in the same place, and vibration is an issue then you have a few choices. You have probably heard of the tennis ball platform. This is a large sheet of board (thick MDF is best) with holes cut into it that are smaller then a tennis ball. You put the sheet on the ground, rest a tennis ball into each hole, and then place another sheet of MDF over it. The idea is that the weight of you and your kit are suspended on the air inside the tennis balls and any vibration is absorbed by the tennis balls. It’s simple, effective and relatively cheap. According to the Wickes website, a sheet of 18mm thick MDF 1.2m x 2.4m is currently £22 (other stores and currencies are available), and 30 used tennis balls can be had for £9 off eBay. 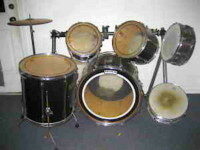 So, for around £50 you could isolate your kit from your surroundings and be suddenly much more popular. Firstly, it is important that the platform does not touch a wall as all that horrible vibration will take the quickest way into any solid surface and you lose all the benefit. Secondly, mass (or weight) is your friend here. If the platform is twice as heavy – two sheets of MDF glued together rather than one – it becomes MUCH more effective. 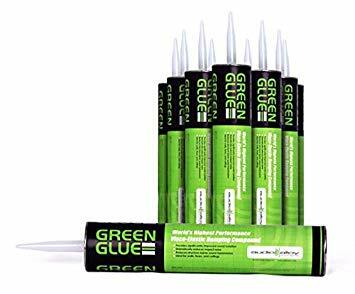 Glue the sheets together with Green Glue (special non-setting acoustic glue available from most builders merchants) and it becomes even more effective. Thirdly, your floor, and the whole building, has to be able to handle the weight of three sheets of 18mm MDF (@ 40kg each) plus your kit, plus you, otherwise you risk structural damage (or complaints from your family). Fourthly, you have to factor in your own weight, and adjust the amount of tennis balls so that the platform does not rock or tilt when you sit down to play. Too few balls and it wont be effective. Fifthly, your stool has got to be on the platform otherwise all the vibration will just go through your body and you’ll lose all the advantages again. So, to do this properly, you need to do you research. Thankfully Google will provide many pages of info if you want to go down this route. There’s also other ways of doing this. The platform in my studio is resting on specially dense foam strips which isolate even more effectively than tennis balls and don’t rock when anyone steps on the surface. They were relatively expensive at £70ish, but they work very effectively (just ask my family). 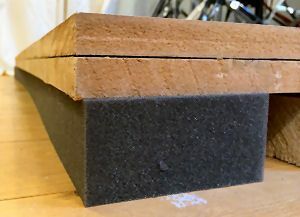 Or, I was talking to a builder friend of mine who has a passing interest in drums, and he suggested that (theoretically) a nice thick layer of rigid insulation slab (think Rockwool RW5) should support and insulate almost as well as the foam. However, I have not tested this so I cant pass judgment on it I’m afraid. But there is also another way that has become more financially viable (as the material used to be rather expensive). If you go to eBay you can find Sorbothane hemispheres for not very much (hunt around for the best price). Sorbothane is a man made material which just happens to be one of the best vibration absorbers known to man. 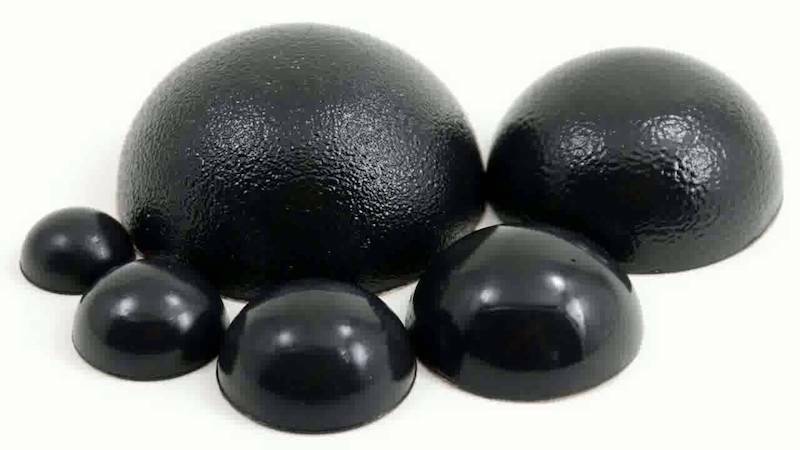 These hemispheres are perfect for putting at the bottom of electronic drum rack legs and then you can do away completely with using a platform. You DO have to know the weight of your kit so you can get the most suitable hemispheres as Sorbothane has an interesting property in that it is not very good at absorption if it is underloaded, and not very good if it is overloaded – it needs to be within a fixed range, and then it works incredibly well. However, that is fine for racks but what about stools, pedals, hi hats etc? Well, the easiest solution is to cut a circle from MDF (again!) , rest that on the hemispheres and then put your stool on the disc. You’ll need to know the weight of the stool, the MDF disc and yourself to work out the best hemispheres to use (theres much information on line about this), but it works very well. 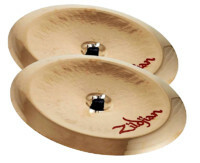 As for hi hats, do the same – cut a disc large enough for your hi hat stand, rest it on the hemispheres and away you go. 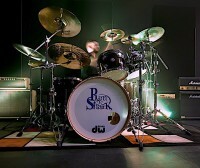 As for the bass drum pad, cut a shape out which covers the pad, the spurs and your pedal and do the same. 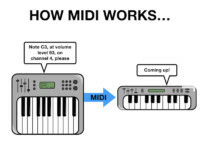 Yes, you can buy commercially available pedal platform that are designed to ‘eat’ the vibration, but this method is much cheaper and actually what the commercially available versions are based on. So there you have it, a few ideas to stop your family, friends and neighbours wanting to hide your sticks (or worse). Noise annoys, but it doesn’t have to be that way.